Before starting your website you need some information that will assist you with deciding on the design, content and structure of your site. Do your homework on your potential customers. Figure out the potential value of customers, who is and isn’t your ideal customer and what your typical visitor looking for. Sometimes businesses jump into the process without gathering this information first. 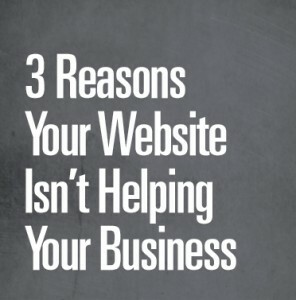 Here the top 3 reasons why your website is not helping you achieve your business goals. Lack of trust building elements. Gaining the trust of website visitors takes a good amount of effort. Having a professional-looking design and original photography are part of these trust building elements. In addition to reviews, ratings and testimonials from past customers including links to postings on other sites. We have designers and online have experience to know what trust building elements work and which don’t. You need to make sure your messaging is consistent throughout all forms of media. The messaging for your website has to match with customer expectations set by your advertising and fulfills the needs of potential customers. To better understand their needs we’ll analyze your customer base and online sales strategy and create the best messaging for your website. Shortcuts taken by coders and developers will make your business and website suffer. Slow page load time, incompatibility with specific web browsers or mobile devices, and broken pages can make the user experience very frustrating. If you site is not fast and easy to work potential customers leave your website. Our websites are always compatible, fast and ready for search engine optimization, due to our standards.